As many as 60 foreign nationals were deported last weekend as part of President Donald Trump's new immigration order after being coerced into giving up their visas or green cards upon arriving in the US, a new lawsuit alleges. The lawsuit was filed in a Virginia court Sunday on behalf of two Yemeni brothers with valid visas — Tareq Aqel Mohammed Aziz and Ammar Aqel Mohammed Aziz — and "others similarly situated." According to the lawsuit, the individuals were detained by Customs and Border Protection (CBP) agents at Washington's Dulles airport and "forced to sign papers that they neither read nor understood." The agents "lied to immigrants arriving after the Executive Order was signed, falsely telling them that if they did not sign a relinquishment of their legal rights, they would be formally ordered removed from the United States, which would bring legal consequences including a five-year bar for reentry to the United States," the lawsuit claims. Their legal immigrant status was subsequently "revoked without due process of law," according to the lawsuit. Trump on Friday signed an executive order barring citizens from Iraq, Iran, Sudan, Libya, Somalia, Syria, and Yemen from entering the US for 90 days while the federal government revisits its screening processes. The order also suspended the US's refugee-admitting program for 120 days, indefinitely barred Syrian refugees from resettling in the US, and gave priority status to minorities fleeing religious persecution. The visa terminations began in the days leading up to the official ban, the Intercept reported on Sunday, and several visa-holders were charged with violating immigration law even though they had not been informed prior to boarding their flights that their visas were no longer valid. The Virginia lawsuit claims that as many as 60 permanent US residents, referred to as "John Does" in the suit, were "compelled into signing I-407 forms against their will and without their knowledge or consent" upon landing at Dulles airport on January 27 and 28. The forms, if signed, mean the signatory has "voluntarily" abandoned their status as a "lawful permanent resident of the United States," according to US Citizenship and Immigration Services. The purported coercion was not isolated to Dulles. Two Iranians with green cards on separate flights from Germany and Qatar to Los Angeles International Airport (LAX) last weekend were also prompted to sign I-407 forms, an immigration attorney who advised them told Business Insider this week. The passengers said they contacted their family members for advice after being handed forms to sign that said "I-407," according to their attorney. Their families, waiting for them at the airport, were then able to consult with a triage of immigration attorneys on the ground at LAX at the time. "This was highly, highly unusual," one of the attorneys, Ally Bolour, told Business Insider. "These forms are supposed to be signed in front of a federal officer, not under duress. I've never seen anything like that before, and I've been doing this for 20 years." Reached for comment, a spokesman for the Department of Homeland Security directed Business Insider to the "Frequently Asked Questions" section of the DHS website. They refused to comment on the lawsuit's claims specifically. The forms were handed out as the Customs and Border Protection agency (CBP) scrambled to implement the executive order signed by Trump last Friday. The Department of Homeland Security initially interpreted it to mean that green-card holders from the designated countries would still be allowed to enter the US, CNN has reported. Green-card holders have to undergo a lengthy vetting process by the DHS before they are granted permanent US residency. But the White House had overruled that decision by Saturday morning, according to CNN, and green-card holders were detained at airports across the country. Those with valid visas were detained, too — some for as long as 18 hours. White House press secretary Sean Spicer said on Monday that only 109 people were detained or inconvenienced by the immigration order on Saturday. Homeland Security Secretary John Kelly updated that figure on Tuesday when pressed about reports that the number had been much higher. 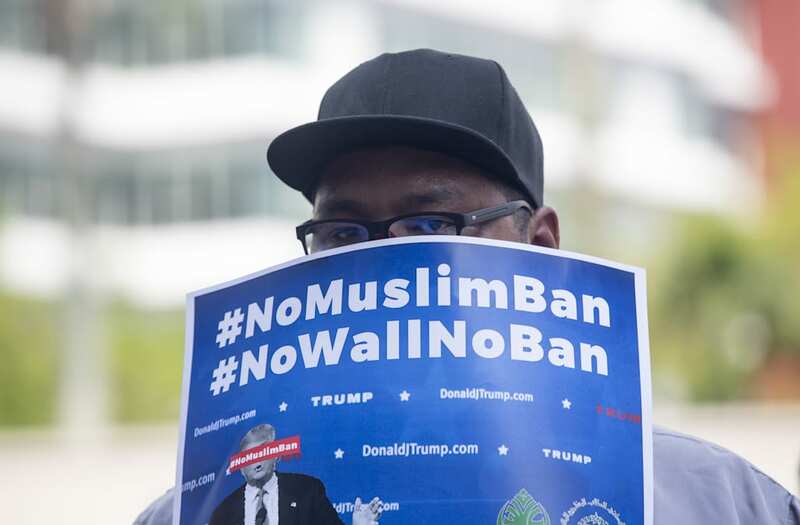 The CBP's acting commissioner, Kevin McAleenan, told reporters on Tuesday that the 109 figure referred to the ban's "initial hours" and that "721 travelers from the affected countries" who had visas to enter the US were denied boarding at their countries of origin. One Iraqi man had his visa revoked before he could travel to Boston to visit his young son, who was flown there late last year for medical treatment after being severely burned at an Iraqi refugee camp. Several other people were deported shortly after they landed in the US, including the two Yemeni brothers who were sent back to Addis Ababa, Ethiopia after relinquishing their green cards under duress. "Asylum law requires CBP officers to affirmatively ask if an applicant fears return when placing them into expedited removal," an immigration official told the Intercept. "By pressuring them to simply get on a plane without going into formal removal proceedings, they are violating our obligations under the refugee convention. We are violating international law."